So you are in the market for a new night vision device. The only problem is after a quick google search you quickly find out there is an overwhelming amount of night vision devices on the market. No worries, we spent the last 12 months testing out the latest night vision gadgets on the market and have narrowed it down to the top 12 best night vision goggles. In this Solomark Night Vision Monocular review, we are going to show you why this night vision monocular made our list. When I first laid eyes on the Solomark night vision monocular (Click here to check price on Amazon), I’m not gonna lie, I thought it was an odd looking device. But never the one to judge a book by its cover we eagerly cracked open the box to see what this night vision monocular was about. One of the things that we noticed and liked pretty much right away is it’s low light sensitivity. Even without its IR illuminator on, this night vision monocular can deliver a usable image in very dim conditions. For most night vision devices this is not the case. 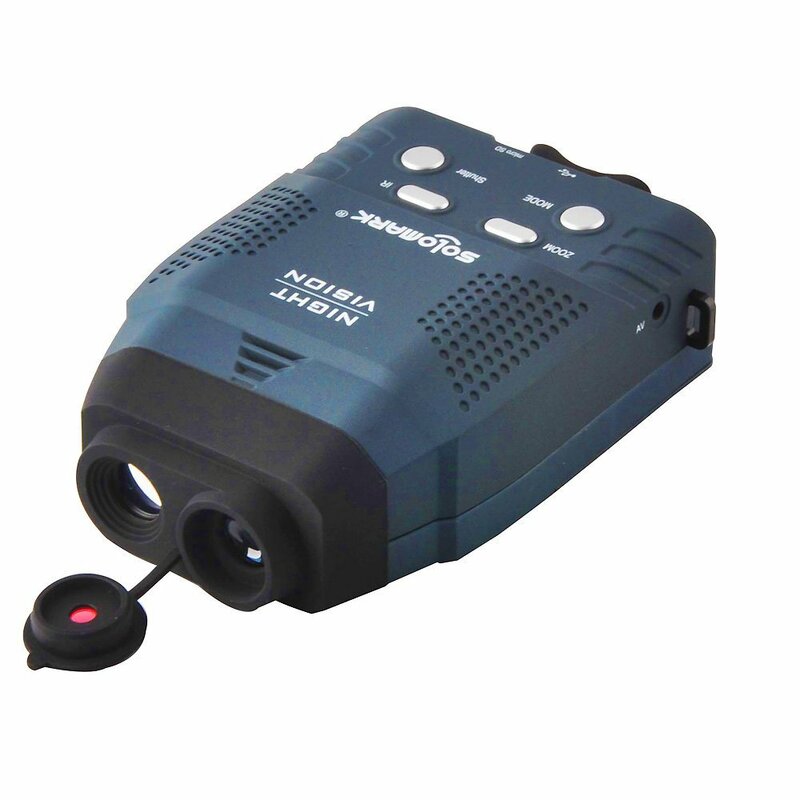 What makes this NVD so cool is its built-in recorder function that allows you to record or take a picture of an image right from the monocular. It even had an AV an USB connector to allow video transfer between the Solomark and your computer. This generation 1 night vision monocular was legitimately fun for us to play with. It has so many extra features it’s hard not to love it. The Solomark monocular is very compact and lightweight, making it a versatile options for an array of night time activities. The only issue we found was that the battery life was short. Granted, we were playing with all the buttons and functions constantly but we were able to get about 5 hours out of it, which is a bit shorter than some of the other night vision devices we tested. The Solomark runs on 4 AA batteries. 1. Low light sensitivity: Even without its IR illuminator on, the night vision can deliver a usable image in very dim conditions. Unlike some other so-called bluffing night visions, this is a real night vision monocular. 2. Video and image function: With this device, you can take photos and videos at any time, record more true-to-life details . (1G micro-SD card inside). 3.integrated color LCD-Screen : From the screen inside the monocular, you can see the images and videos clearly. 4. AV and USB function: It’s easy to display image and videoson the television and transfer files to a computer, which enables you to share fun with your family and friends. 5. Illumination Flexibility: You can vary the amount of IR illumination by 7 levels and obtain a proper brightness of the image. 6. Zoom control: You can vary the size of the image by 1X, 1.3X, 1.6X, 2X. 7. Handy and safe ：It can be mounted on a tripod, put into a cloth bag, or linked to a binocular harness. And it is covered by rubber on the outface, which gains more friction, not easy to slip out. 8. Compact Size：LWH：5.8in x 4in x 1.85in. Net Weight：11.5oz. Field of view: 14°field of view. This is a great night vision monocular. We loved all the extra little functions as well as the overall quality of this product. The fact that you can record and take pictures is priceless, especially if you plan on using this NVD for surveillance. If you found this Solomark night vision monocular review helpful please take a moment to share this review with your friends.